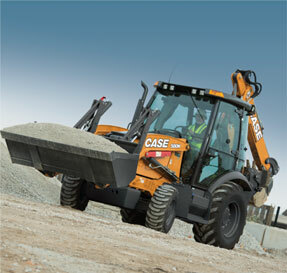 No other backhoe loader can match the productivity and versatility of CASE's machines. CASE backhoe loaders have amazing lift power to handle the toughest conditions with ease. Industry leading breakout force, improved loader lift capacity and best in class cab comfort come standard on all models. Additional features include a loader arm designed to increase breakout force, load stability and push power. Whether you are purchasing your first backhoe loader, or expanding your fleet, CASE has the right machine for any application. CASE backhoe loaders are Tier 4 emissions compliant, utilizing Diesel Oxidation Catalyst (DOC) or Selective Catalytic Reduction (SCR) technology. The CASE 580N EP uses DOC with a particulate matter catalyst solution that requires no extra fluid, no filters to replace, and no extra work. The remaining CASE backhoe models rely on SCR to meet emissions regulations without sacrificing power. SCR requires no regeneration and no new filters. Just fill your Diesel Exhaust Fluid (DEF) tank when you refuel, and you're ready to go.